There is a huge paradigm shift taking place in the way buyers are engaging with sellers. That is—they aren’t. The Internet is impacting the way every consumer and every company does business in a profound way. You may have noticed that your buyers are using Internet research to make buying decisions on their own. They aren’t coming to you to learn about the products or services you and your competitors sell. As a result, buyers are losing out on the solutions sellers can provide, and dissatisfied sellers know they could be doing more but aren’t sure how. The Internet isn’t the only culprit, however. The relationship between buyers and sellers was already broken before the Internet came along and made having to deal with salespeople optional. Traditional selling, for the buyer, was, and is, too expensive given the investment of time and effort. Over the last 50 years, there have been enormous changes in the world around us, from space flight, to cell phones, to the Internet, and more. During that time, however, there has been little, if any, significant shift in the focus of selling methodologies. Companies worldwide continue to dump billions of dollars into traditional training for salespeople, with lackluster results to show for it. Improve the process. Instead of focusing exclusively on developing the skills of individual salespeople, focus instead on improving the process of selling. The landscape of buyers is changing at such a rapid pace that we can’t reasonably expect sellers to deal with these changes entirely on their own. Sellers require updated tools, sales managers require a modern process, and C-level executives require a sustainable long-term selling system that will bring their company’s sales process into the twenty-first century. 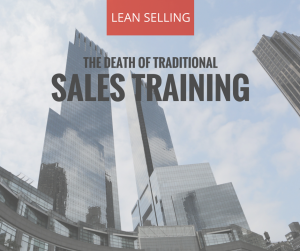 Traditional sales training is no longer enough. A new tool you should consider having in your arsenal is Lean Selling. Lean Selling is not just a tool for a single employee within your organization. Rather, it represents a fundamental shift in the entire process of how a company relates to its buyers. 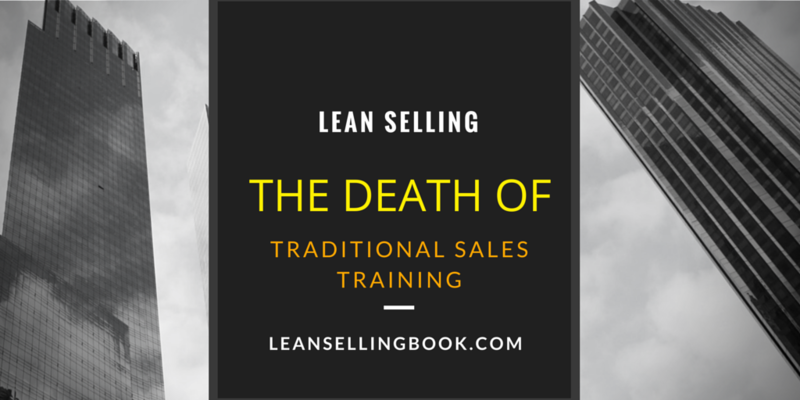 Learn more on how to become one of the early adopters of this system—the Lean Selling System. Check out the book first, then reach out if you want to kick around a few ideas on how you can get your organization started with Lean Selling, and moving toward a more productive and predictable sales process.